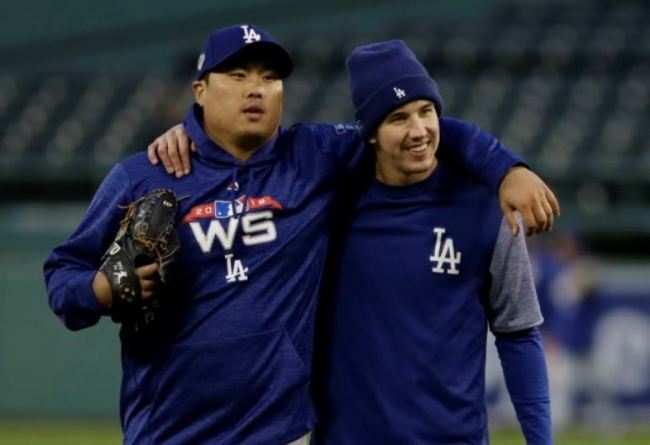 The Los Angeles Dodgers' South Korean starter Ryu Hyun-jin took a loss in a historic World Series start against the Boston Red Sox. Ryu became the first South Korean to start a World Series game when he took the hill at Fenway Park on Wednesday (local time) for Game 2. The left-hander was pulled after giving up a run in 4 2/3 innings, with the Dodgers leading 2-1, but his earned run total ballooned to four after reliever Ryan Madson allowed three inherited runners to score. It was 4-2 for the Red Sox after five innings, and that stood as the final score, as Ryu went down as the losing pitcher. Boston leads the series 2-0. Ryu allowed six hits, while striking out five and walking one. He was also trying to become the first South Korean pitcher to win a World Series game, but will have to wait for another shot in Game 6 next Tuesday, if the series goes that far. Before Ryu, Kim Byung-hyun with the 2011 Arizona Diamondbacks and Park Chan-ho with the 2009 Philadelphia Philies had pitched in the World Series, but both did so in relief. Ryu made a quick work of the Red Sox in the bottom of the first, needing just 11 pitches to retire the side in order. But in the second, Ryu gave up a one-out double to Xander Bogaerts that bounced off the Green Monster in left field. Two batters later, Ian Kinsler singled home Boagerts to put the Red Sox up 1-0. Ryu worked around a one-out single by Mookie Betts in the third. After the Dodgers took a 2-1 lead in the top of the fourth, thanks to Matt Kemp's sacrifice fly and Yasiel Puig's single, Ryu had a three-up, three-down inning in the bottom fourth. Ryu got two quick outs in the fifth before the bottom fell out. Ryu worked the count to 0-2 on No. 9 hitter Christian Vazquez, and then his four-seam fastball just missed on the inside corner. Ryu started toward the dugout, thinking he'd just picked up an inning-ending strikeout, but Vazquez got a new life and then single to right on the next pitch. Betts followed up with a single, and Ryu walked Andrew Benintendi to load the bases. That was the end of Ryu's day. Madson came on to face right-handed Steve Pearce but walked him on five pitches, which tied the score at 2-2. J.D. Martinez dumped a single to right for two more runs to give the Sox a 4-2 lead. The Red Sox won the first game 8-5, with five of those runs coming with two outs. In Game 2, all four runs were scored with two outs.